Definition: Garter springs are long length extension springs with ends which are modified in different manners in order to make them connect and form a garter belt. 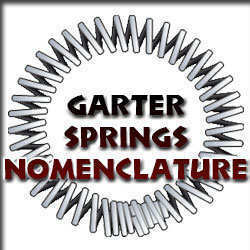 Other term for garter springs. Measurement of the thickness of the coils that make up the extension spring’s body. Measurement of the thickness of the garter spring/belt once the ends are connected. Measurement of the hole inside the garter spring/belt once the ends are connected. The extension spring’s body is the section where you have the coils so the body length is the measurement of the body’s length. The active coils that make your garter spring function. Hooks which are made from the ends of the extension spring that’ll hook with each other in order to connect the garter spring. One of the spring ends is tapered so that it may be inserted into the other end thus making male and female connecting parts. The constant amount of force it will take the spring to travel a certain amount of distance. Additional force to the one already listed in rate. This force is energy already gathered in between the coils and is released when the tension spring is extended just enough so that you may see light in between the coils. The motion in which an extension spring is pulled or extended. The distance traveled is calculated by subtracting the length inside hooks from the extended length. The weight being applied on the spring’s hooks in order for it to reach an extended length. The maximum amount of travel your spring is able to achieve considering the strength of its hooks. The maximum amount of load your spring is able to undergo considering the strength of its hooks. Maximum Stress at which your garter spring will perform indefinitely without failure for a given minimum stress limit.